Tag line: "CECIL B. DEMILLE'S MIGHTY SPECTACLE! Men Against Giant Sea Monster 50 Fathoms Down!" Cecil B. DeMille was one of the most influential filmmakers in Hollywood history, creating such big-screen spectacles as The Sign of the Cross, The Crusades, The Greatest Show on Earth and The Ten Commandments. As you can tell by this brief filmography, DeMille had a knack for making big movies, which told larger than life stories and were decked out with casts grand enough to support them. Initially, one might be a bit reluctant to put Reap the Wild Wind in the same category as these other DeMille epics, but I believe that's exactly where it belongs. Reap The Wild Wind is every bit as ambitious as any of the movies I mentioned above, and deserves to take its place among the filmmaker's most exciting works. In 1840, the business of America was conducted by sea, and the waters surrounding the Florida Keys were some of the most traveled in the country. Of course, where there are trade ships, you're also likely to find pirates, not to mention profiteers, who grow rich salvaging the cargo of wrecked ships. Loxi Claiborne (Paulette Goddard), a Captain of her own salvage vessel, rescues Capt. Jack Stuart (John Wayne) and his crew when their ship collides with a reef, leaving it paralyzed. But as Loxi is busy pulling the men out of the water, the area’s most notorious profiteers, the Cutter Brothers (Raymond Massey and Robert Preston), make off with Stuart’s cargo. Determined to end the tyranny of the Cutters, Stuart sets out to bring both men to justice. In order to do this, however, he must team up with Steve Tolliver (Ray Milland), the second in command of the shipping company for which he works. Unfortunately, Stuart and Tolliver don’t like each other very much, and their already strained relationship is further complicated when both men fall in love with Loxi. 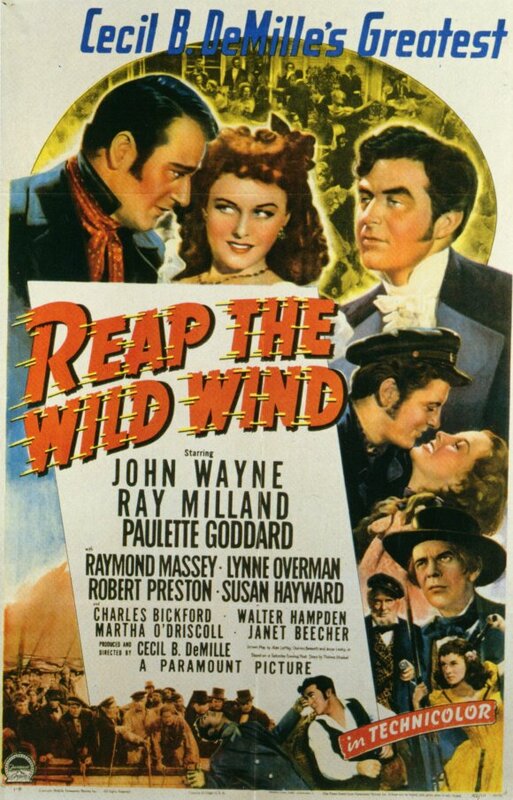 If you’re looking for excitement, then Reap The Wild Wind will give you your fill, and then some. The movie starts strongly, with an extremely tense shipwreck scene, and continues at this same pitch through much of the film, culminating in a nail-biting underwater battle with a giant squid. The scenes at sea are especially thrilling, and while I admittedly found the love triangle that develops between the three leads to be somewhat of a show-stopper (another trait of DeMille's, unfortunately: heavy-handed romances that intrude on the action), it wasn't enough of one to hold the film down for long. 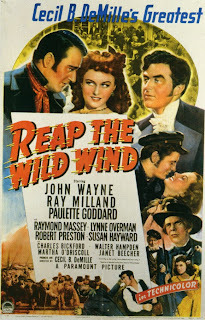 In true Cecil B. DeMille style, Reap the Wild Wind is a good, old-fashioned Hollywood spectacle. @tjpieraccini: Thanks for the awesome comment! I haven't yet seen WAKE OF THE RED WITCH yet, but it sound slike I should. And, like you, I was surprised by the characters Wayne played around this time. Yes, they're truly anti-heroes. And it's been a while, but remember liking ANGEL & THE BADMAN as well!